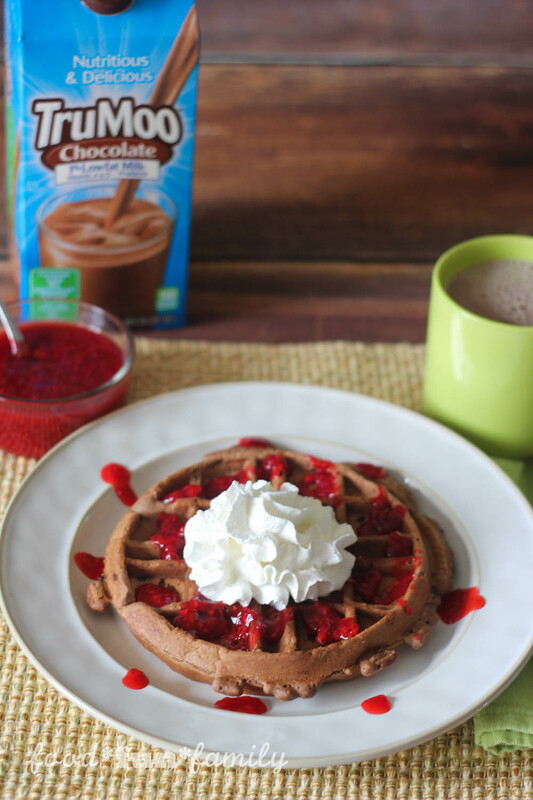 Thank you TruMoo for sponsoring this post and triple chocolate waffles recipe! Try TruMoo in more delicious recipes this season! Tis the time of year for hot chocolate, and I have a new favorite way to enjoy it. It’s the easiest, tastiest, creamiest hot chocolate ever – and all I have to do is heat up a mug of TruMoo chocolate milk. Seriously! You’ve got to try it! My youngest son is a hot chocolate fanatic, and it has passed his test. I love giving it to him because I know that he’s getting nutrition that he needs. Plus, TruMoo has NO artificial growth hormones*, NO high fructose corn syrup and a delicious taste kids (and adults!) love. Because we’ve been enjoying TruMoo HOT this month, I figured it would be fun to use it in a hot breakfast recipe for Valentine’s Day (my favorite!). And what better to celebrate Valentine’s Day than chocolate and red berries? The answer is…there is nothing better. As picky as my son is about his hot chocolate, I’m pretty picky about my waffles. I was concerned before starting my recipe that these waffles not be too sweet or dense or dessert-like because I wanted them to be appropriate for a special breakfast. I was pleased that these waffles were light and fluffy, with just the right amount of chocolate and sugar. I had my husband test taste the very first waffle that came off the waffle iron, and he was so impressed that he immediately asked for another one. 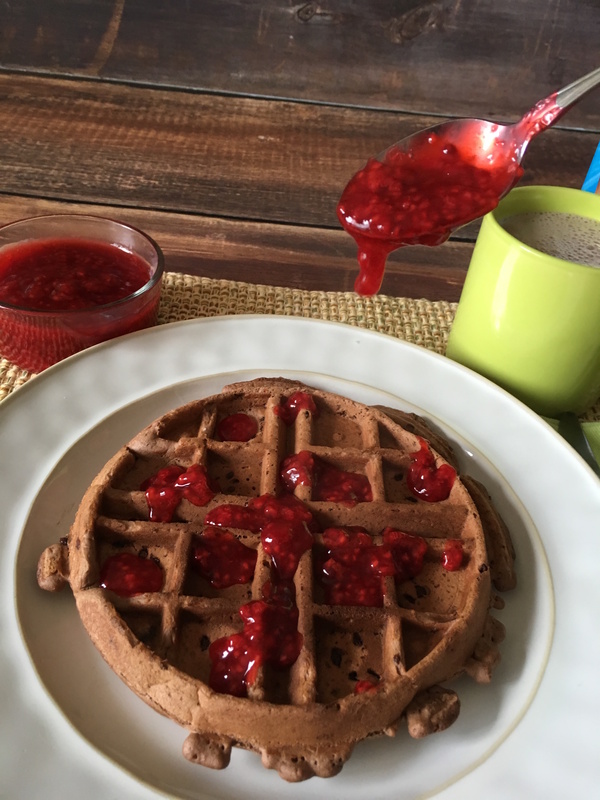 Three chocolates (cocoa powder, TruMoo chocolate milk, and semi-sweet chocolate chips) combine to make the perfect chocolate waffle for a special breakfast treat! 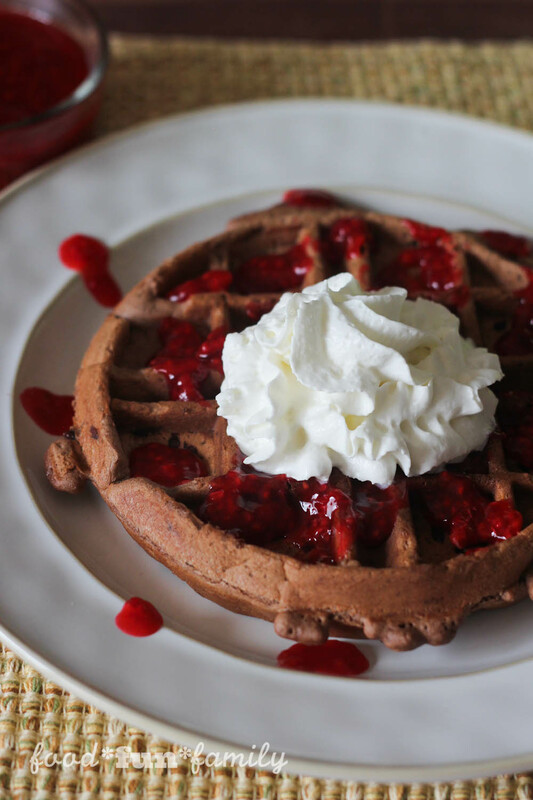 The chocolate waffles are delicious enough on their own, but with the addition of a homemade raspberry sauce and TruMoo hot chocolate, this was a Valentine’s Day breakfast to die for! Add all waffle ingredients except for the chocolate chips into a medium mixing bowl and stir or beat just until thoroughly mixed and smooth. Stir in chocolate chips. 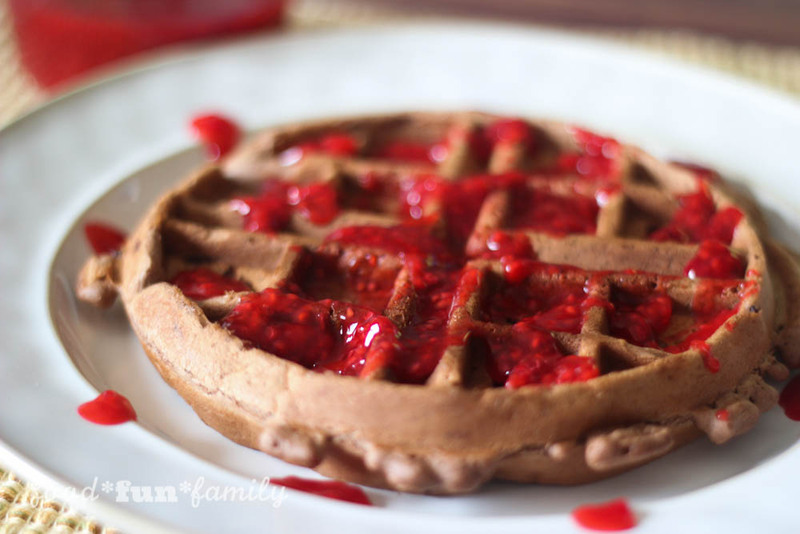 Pour waffle batter onto heated waffle iron and cook according to your waffle iron's directions. Remove waffle when cooked through and keep warm until ready to serve. I like to stick mine on an oven-safe plate in a warm oven. Serve with raspberry sauce and whipped cream and a side of TruMoo hot chocolate or make it simple and serve with powdered sugar (and more hot chocolate, of course!). Toss the frozen raspberries with sugar and cornstarch. 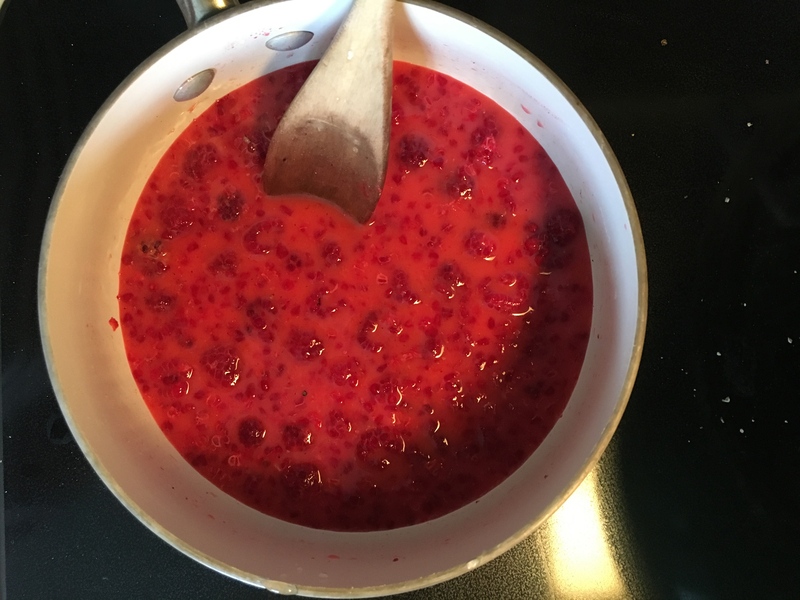 Add raspberry mixture to a small saucepan over medium heat. Add cold water and lemon juice and stir. Continue stirring for several minutes, until raspberry sauce thickens and becomes translucent and a darker shade of red. Remove from heat and pour, hot, over your waffles. Note: I did not have to mash my raspberries, because by the time the sauce was finished cooking, they had softened and broken up on their own. If you have large chunks of berries in your sauce, you may want to mash them before serving. 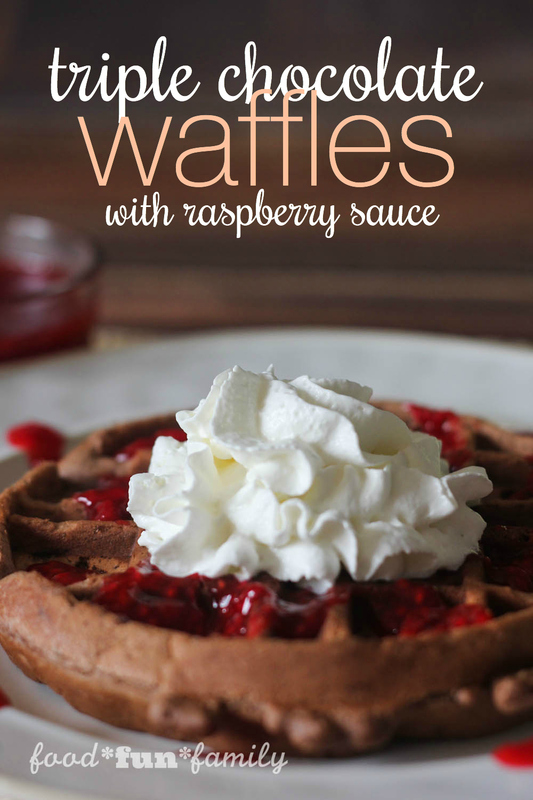 Note: this recipe will yield a different amount of servings depending on the size of your waffle maker. We made about 8 waffles on ours. Check out the quick flipagram video on Instagram I did while making this recipe (individual steps included)! Have you ever tried TruMoo hot? 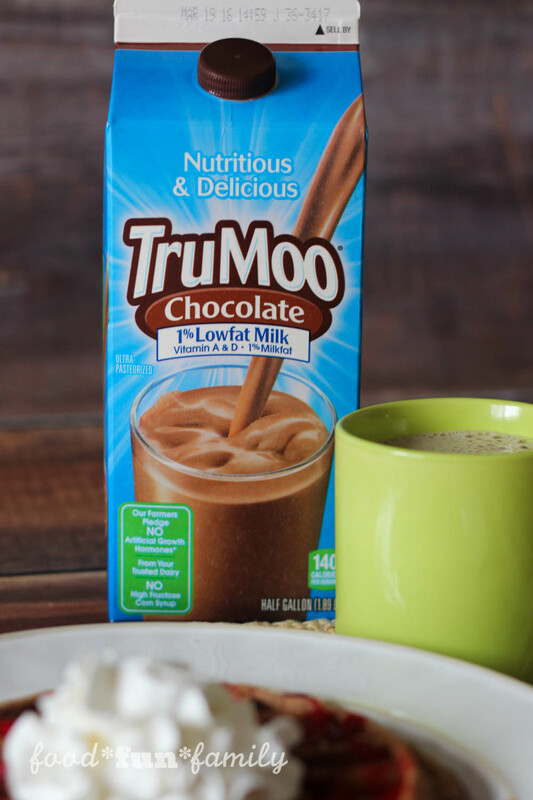 For more delicious recipe ideas with TruMoo chocolate milk, check out hashtag #TryTruMooHot and visit TruMoo on Twitter, Instagram, Pinterest and Facebook. *Note: No significant difference has been shown between milk derived from cows treated with the artificial growth hormone rbST and non-rbST-treated cows. 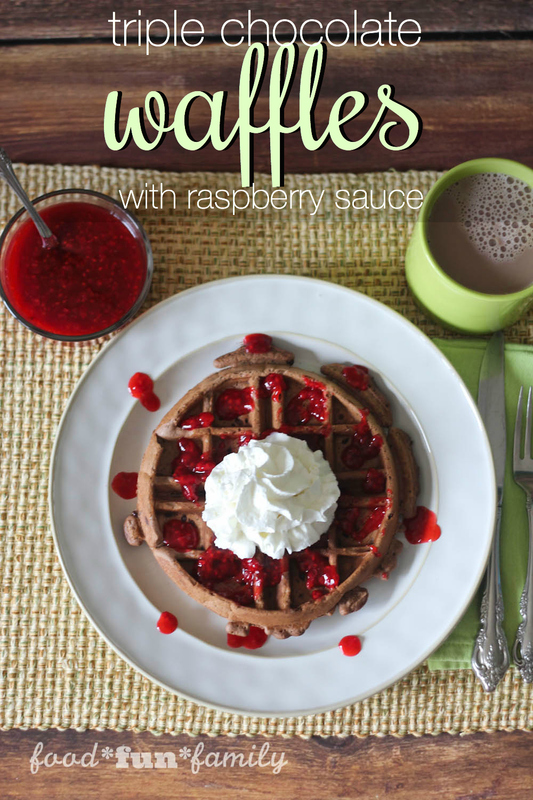 I love your Raspberry sauce recipe and think it looks so pretty on these Chocolate waffles. I am going to make this recipe. It looks like a lot of fun to make with my daughter! I’m picky about my hot chocolate as well so I don’t blame your son one bit! haha I really need to try out this TruMoo, it sounds healthy and delicious! Thanks for linking up with delicious dishes recipe party! Yum, these waffles look amazingly delicious! Thanks so much for sharing your yummy recipe on the Monday Funday Party! Thank you so much for sharing your delicious recipe with us at Merry Monday.